Electronics & Communication Engineering deals with the electronic devices, circuits, communication equipments like transmitter, receiver, integrated circuits (IC). It also deals with basic electronics, analog and digital transmission & reception of data, voice and video (Example AM, FM, DTH), microprocessors, satellite communication, microwave engineering, antennae and wave progression. 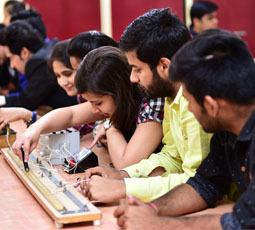 It aims to deepen the knowledge and skills of the students on the basic concepts and theories that will equip them in their professional work involving analysis, systems implementation, operation, production, and maintenance of the various applications in the field of Electronics and Communications Engineering. What does an Electronics & Communication Engineer do? 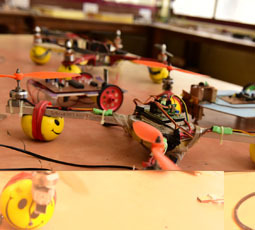 Electronics and Communication Engineering opens up great career prospects for the students. The students after completion of the degree can easily avail job opportunities in manufacturing industries and service organizations such as broadcasting, consulting, data communication, entertainment, research and development; and system support. The candidates can also work in modern multimedia service firms that are involved in real-time transfer of information through video conferencing and internet broadcasting. The opportunities are galore for electronics and communication engineers as they are employed in variety of sectors such as Indian Telephone Industries, Civil Aviation, Development Centers in various States, Defense, NPL, A.I.R, Posts and Telegraph Department, Railways, Bharat Electronics Limited, D.R.D.O, Telecommunication, Software Engineering/IT, Power sector, Hardware Manufacturing, Home Appliance and VLSI design, Television Industry and Research & Development.